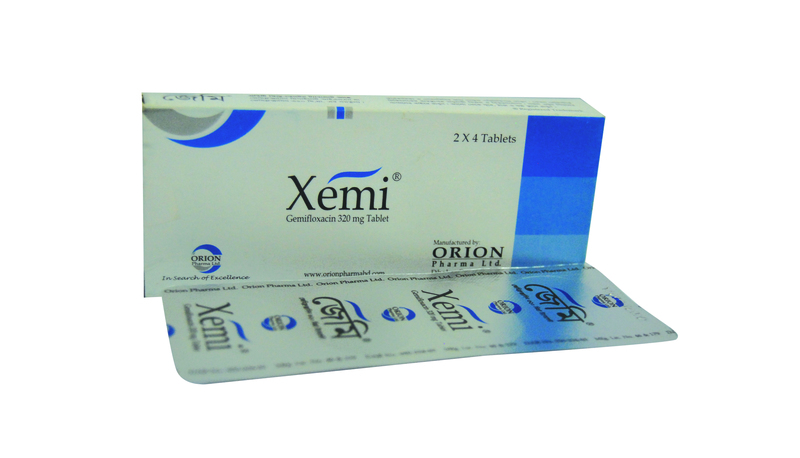 Xemi Tablet: Each film-coated tablet contains Gemifloxacin mesylate INN equivalent to Gemifloxacin 320 mg.
Gemifloxacin can be taken with or without food and should be swallowed whole with a liberal amount of liquid. Gemifloxacin is contraindicated in patients with a history of hypersensitivity to Gemifloxacin, fluoroquinolone antibiotic agents, or any of the product components. The majority of adverse reactions include rash, nausea, diarrhea, urticaria, vomiting, headache, abdominal pain, dizziness and vertigo. Additional drug-related adverse events included: anorexia, constipation, dermatitis, dry mouth, dyspepsia, fatigue, flatulence, fungal infection, gastritis, increased creatine phosphokinase, insomnia, leukopenia, pruritus, somnolence, taste perversion, thrombocythemia, and vaginitis. Other adverse events that occurred in patients were: abnormal urine, abnormal vision, anemia, arthralgia, asthenia, back pain, bilirubinemia, dyspnea, eczema, eosinophilia, facial edema, flushing, gastroenteritis, granulocytopenia, hot flashes, increased non-protein nitrogen, leg cramps, moniliasis, myalgia, nervousness, non-specified gastrointestinal disorder, pain, pharyngitis, photosensitivity/phototoxicity reactions, pneumonia, thrombocytopenia, tremor. The majority of the post-marketing adverse events reported were rash, anaphylactic reaction, erythema multiforme, skin exfoliation, facial swelling; hemorrhage, increased international normalized ratio (INR), retinal hemorrhage; peripheral edema; renal failure; prolonged QT, supraventricular tachycardia, syncope, transient ischemic attack; tendon rupture. Fluoroquinolones, including Xemi, are associated with an increased risk of tendinitis and tendon rupture in all ages. Xemi should be discontinued if the patient experiences pain, swelling, inflammation or rupture of a tendon. Xemi should be avoided in patients with a history of prolongation of the QTc interval, patients with uncorrected electrolyte disorders and patients receiving antiarrhythmic agents. Serious hypersensitivity and/or anaphylactic reactions have been reported in patients receiving fluoroquinolone therapy, including Xemi. As with other fluoroquinolones, Xemi should be used with caution in patients with CNS diseases such as epilepsy or patients predisposed to convulsion. Pediatric Use: Safety and effectiveness in children and adolescents less than 18 years of age have not been established. Geriatric Use: Geriatric patients are at increased risk for developing severe tendon disorders including tendon rupture when being treated with a fluoroquinolone such as Gemifloxacin. Pregnancy Category C. The safety of Gemifloxacin in pregnant women has not been established. The systemic availability of Gemifloxacin is significantly reduced when an aluminum- and magnesium- containing antacid is concomitantly administered. Calcium carbonate (1000 mg) given either 2 hr before or 2 hr after Gemifloxacin administration showed no notable reduction in Gemifloxacin systemic availability. When sucralfate (2 g) was administered 3 hours prior to Gemifloxacin, the oral bioavailability of Gemifloxacin was significantly reduced. Gemifloxacin 320 mg at steady-state did not affect the repeat dose pharmacokinetics of theophylline. Gemifloxacin 320 mg at steady-state did not affect the repeat dose pharmacokinetics of digoxin. The effect of an oral estrogen/progesterone contraceptive product (once daily for 21 days) on the pharmacokinetics of Gemifloxacin are not considered clinically significant. The effect of co-administration of a single dose of 320 mg Gemifloxacin with cimetidine 400 mg four times daily for 7 days are not considered clinically significant. The effect of co-administration of a single dose of 320 mg Gemifloxacin with omeprazole 40 mg once daily for 4 days are not considered clinically significant. Administration of repeated doses of Gemifloxacin (320 mg once daily for 7 days) to healthy subjects on stable warfarin therapy had no significant effect on warfarin-induced anticoagulant activity. Xemi Tablet: Box containing 2x4\'s tablets in Alu-Alu blister pack.